You’ve heard it over and over again: Drink eight, 8-ounce glasses of water a day to stay hydrated and healthy. It’s true that you need to stay hydrated, but the idea of 64 ounces of water a day is actually a myth. Guidelines for water consumption first appeared in the U.S. in 1945, when the Food and Nutrition Board of the National Academy of Sciences recommended the consumption of 2.5 liters of water per day. Frederick J. Stare, an influential 21st century nutritionist who defined the four food groups, was one of the first to recommend that humans consume six or so 12-ounce glasses of water a day. But actual water isn’t always necessary. Your foods contain plenty of it. For example, a baked potato is 75 percent water. Other beverages, such as juice and milk, also count towards your total. And yes, caffeinated beverages also count, according to Dr. Stanley Goldfarb, a nephrologist at the University of Pennsylvania who reviewed research claims on drinking eight glasses of water and studied how the kidneys handle it. Two good ways to determine whether you’re getting enough hydration are simple and common. 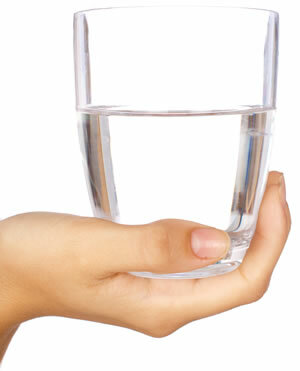 Runner’s World magazine says thirst is a good indicator: if you’re thirsty, drink something. Runner’s World also suggests that you check the color of your urine. If it’s clear or light yellow, you’re fine; if it’s the color of apple juice or darker, you need to drink something — especially if you’re involved in endurance activities such as running a race. Exercising so hard that you sweat. Environment, such as hot or humid weather or high altitude. Illness or health conditions, such as fever, vomiting or diarrhea. Plain water is best. If you’re involved in intense activity on a hot day, you may need a sports drink that has electrolytes and sodium to fully replenish your system. You can’t drink too much. It’s rare, but yes, you can. Too much water can cause symptomatic hyponatremia, a condition where the sodium levels in the blood become dangerously low. Need a good routine to recover from a run? Dr. Lacey and Dr. Craig suggest “yoga on a roll”. This 38-minute routine, led by instructor Rebecca Pacheco, can give you greater range of motion because it works your entire body. If you don’t have a foam roller, you can also use a yoga block, or do the routine without the roller. Let us know in the comments how well this works for you! More yoga videos can be found on the Runner’s World website. Running to get fit or stay healthy is good. But running too many miles or too many marathons may be too much of a good thing. CNN reports that runners who average more than 20 miles a week do not have a longer lifespan, according to research presented March 30 at the annual American College of Cardiology Scientific Sessions in Washington. In fact, these runners live about as long as those who don’t run at all. Researchers don’t know yet why this happens. The study’s original goal was to determine if runners’ use of NSAID painkillers, such as ibuprofen and naproxen, had an affect on their longevity. Runners also gave information about risk factors such as diabetes, high cholesterol or high blood pressure. According to CNN, a 2012 study from the Mayo Clinic found that excessive training can cause cardiovascular damage such as scarring and enlargement of the heart and blood vessels. The shortened lifespans for long-distance runners could come from too much “wear and tear” on the hear, Dr. O’Keefe said this week. Extreme exercise may actually create a “remodeling” of the heart, which could negate some of the benefits of working out. O’Keefe recommends that those who run for health benefits maintain a slow to moderate pace, about two or three times per week, for a total of one to 2.5 hours.